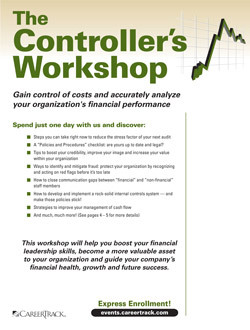 Your job as your organization's controller means that it's up to you to juggle people, projects, finances, budgets, and purchases … not to mention other critical duties like staying on top of state and federal regulatory agency requirements, providing complex financial data at a moment's notice, and overseeing the financial policies and direction of your organization. Managers, CEOs, CFOs, investors, and company stakeholders — all depend on the accurate financial data, forecasting, analysis, and reporting that controllers provide. The Controller's Workshop is an intensive, fast-paced look at how to improve your day-to-day job performance by working smarter — not harder or longer (you already put in enough hours in a day!). You'll discover an incredible amount of information, ideas, how-to's, and tools for improving your accounting team's performance, enhancing your financial reporting skills, maintaining successful internal controls, monitoring cash flow, controlling costs and much more. Your business looks to you for financial leadership. This intensive workshop will help you tackle a broad range of financial issues head on, from monitoring controls and cash flow to advising upper management on purchases, hiring, expansion, and other areas that are directly affected by financial performance. What CEOs and CFOs really want and expect from the controller at their organization — and learn how to give it to them! Who in your organization is capable of fraud? The answers may surprise you!